A wedding or a party need many different ingredients to make it a success but, no matter how carefully you plan, with things like photographers and caterers which you may also need to consider, no wedding or party will succeed unless there are guests to share in the celebration and that is where invitations come in. These days most invitations to a celebration come in the form of an invitation on a card or on a decorative letter simply stating that you've been invited to attend, the location of the event and the time to arrive and asking you to RSVP which is a French abbreviation asking you to respond and let the sender know if you are able to attend or not. However, some people prefer to invite guests in the form of a letter as it's more personal. These are usually sent out a few weeks, or sometimes months, before the celebration itself is due to take place. Below is an example of how you might choose to structure an invitation in letter written form. There can be variations obviously but the key things to include are the name(s) of the person who is making the invitation, who and what the event or celebration is for, the date and time on which it is to be held, the venue or the location of the event and how you want the recipient to respond to let you know whether they'll be attending or not. 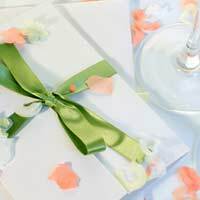 If you're sending out a letter to invite guests, as opposed to sending a basic invitation card or note, it's probably likely that it will be slightly more formal than it might be usually, even if you're sending them to friends and family but, depending on your relationships with your guests and the nature and tone of the celebration, it might be written in a more 'wacky' style and be less formal. However, for the purpose of this article, the example letter below adopts a more formal tone for a wedding invitation letter, although you may need to be even grander and more formal if it's a 'high society bash'. Here is an example of a wedding invitation. Jenny and I would like to request the pleasure of your company in joining us to celebrate the forthcoming marriage of our son Graham and his fiancée Debbie. The wedding will take place at St. Luke's Church in the village of Bramwell at 2pm on Saturday, June 9, 2007. Following the ceremony, you are also invited to join us at the Cross Keys Hotel in Hoyton for the wedding reception beginning at 4pm. I have enclosed a map and directions to both locations and if you need hotel accommodation for the night, we will be happy to arrange that for you.